I have two girls who love to read, both tweensters, and a 5-year-old son for whom being read to each night at bedtime is an essential part of life. Santa will inevitably deliver some books under the tree come Christmas morning, but each year I also try to come up with some book- and reading-related gifts to suggest to the big guy in red. These gifts aren't just there to encourage reading, but because they are actually fun to receive! I've pooled my favorite reading-related gifts on the Pinterest board featured below. I'm going to introduce a few here that I think your kids might be delighted to unwrap this holiday season. These make the perfect extension activities and will even work while traveling! Mudpuppy currently makes three of these sets: Goodnight, Goodnight Construction Site, Madeline, and Babar Museum of Art. With each set, which comes in a metal tin, multiple backdrops are provided so that kids can create their own favorite scenes from each book. These are perfect alone, or paired with books you might want to introduce your little one to. When you subscribe to Peekapak, your child gets a monthly box in the mail (and what child doesn't love snail mail), filled with literacy extension activities based on a story. Stories come with creative play props, dramatic play ideas, and craft possibilities. Activities are also presented according to age-appropriateness. If you want to promote literacy, problem-solving, fine motor skills, and learning through play, consider Peekapak. These things are so functionally adorable that I want every set! If Where the Wild Things Are isn't your cup of tea, try Paddington, Peter Rabbit, The Night Before Christmas, Thomas the Tank Engine, Harry Potter, or several dozen more storybook themes! Or order your own custom set of handmade wooden blocks based on your child's favorite book. If you pick up a copy of any of the main (I mean written by Eric Litwin and James Dean, not the newer titles that Litwin did not write the music for) Pete the Cat books, you might not be wowed. It kind of cracks me up that a librarian wrote a very poor review of the first one in a major book review journal. She needed to download the free accompanying song, to understand what Pete is really all about. Litwin's music has the groove and beat to bring these stories to life and teach some very basic concepts, like counting, colors, and rhythm. My son was obsessed with these in preK, as was every other kid in his class. This adorable plush doll, which comes in two sizes, makes the perfect gift for your Pete fanatic. Or, pair it with one of the books for a wonderful gift! I stumbled upon this Etsy site and thought I'd died and gone to heaven. Quiet books encourage babies, toddlers, and preschoolers to relate reading (through turning pages) to their sense of sight, touch, and sound. Quiet books make stunning gifts for a special little one, and this shop does them very well. However, as they can get a wee bit expensive, I've also added a couple of links to my Pinterest board (below) that demonstrate how to make these yourselves. Or, if handmade isn't important to you, try this giant-sized version from Land of Nod, which also caught my eye. Santa delivered this award-winning game to our house three years ago, and I still can't believe what a powerful punch such a small gift can pack. With a roll of the cubes you can make up the wildest story imaginable, and several ways to play alone or in groups are provided. Nothing is cooler than comics. I have a 9-year-old daughter who is obsessed with grapic novels, so this award-winning activity set would be perfect for her. And if you have a little artist on your hands, this might be a great way to get them to connect art with reading and writing. You get to not only make a comic book, but publish it! That's right, after kids create the final product, they mail away to have it professionally printed. Super cool. And if comics aren't their thing, kids can make a traditional book, too. This is such a cute idea -- read a book with your child, write down the title and rate it, and then tear out each page until the bookworm inside eats though the entire book. Creative way to encourage reading! Know a kid who loves Percy Jackson? (I think I know several dozen!) How about a set of Percy Jackson pencils? I also love this necklace, based on the same series. These are so stinking adorable! Perfect for the Harry Potter-obsessed muggle on your list. Or if you like DIY, try this set of Harry Potter-inspired potions. Or make a Quidditch Robe if you're crafty with a sewing machine. These look fabulous! These would be perfect for the DOAWK fan under your roof. And there are lots of other cool Greg paraphernalia on Jeff Kinney's website. My daughter was the hit of the 4th grade a few years back with her Wimpy Kid t-shirt. Follow A Book Long Enough's board Christmas and Hanukkah Gifts for Kids: Book Related on Pinterest. Now that Thanksgiving is over, do you have your tree up? (Me, neither. Here in Florida it's way too hot to buy a live tree this early, unless you like a pile of kindling with ornaments rolling off the branches by Christmas Eve.) But maybe you're thinking about decorating and maybe you even like theme decorating. 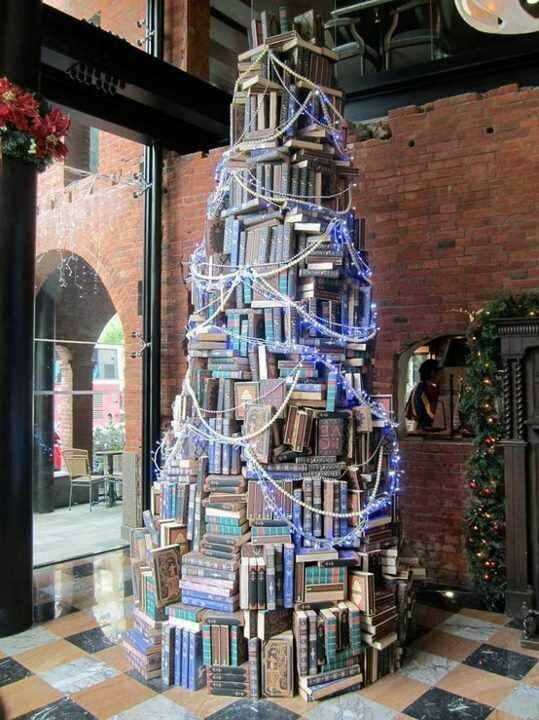 I've always had a fantasy about an entire room decorated in a book theme for Christmas. And have I found some awesome stuff on the interwebs to share with you, fellow bookworms. Join me while I indulge my dream of book-themed Christmas decor. First off, let's start with some trees. How about this engineering feat: a tree made of books? I love how they've used different shades of green book covers, and added a rolling base. 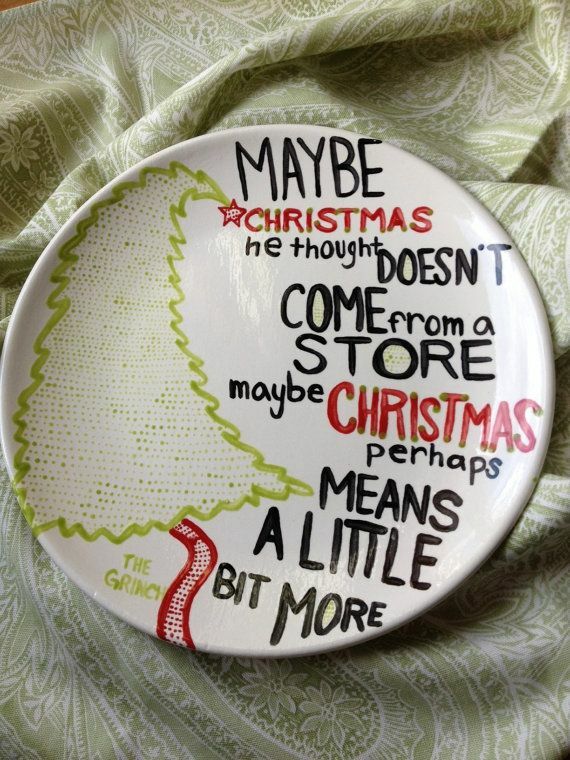 From Juniper Books via Buzzfeed. On this one, I love the horizontal and vertical sets of books, along with the lights. Source unknown, uploaded to Pinterest. 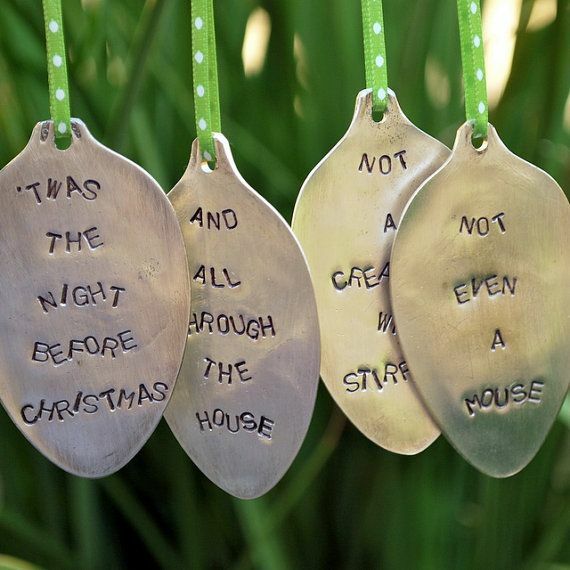 This is such an adorable, clever idea. From All Things Thrifty. From Cocoa Daisy, with a link to instructions. Don't worry if (like me) you can't figure out how to make it, it's for sale from MyWhimsicalLily via Etsy. 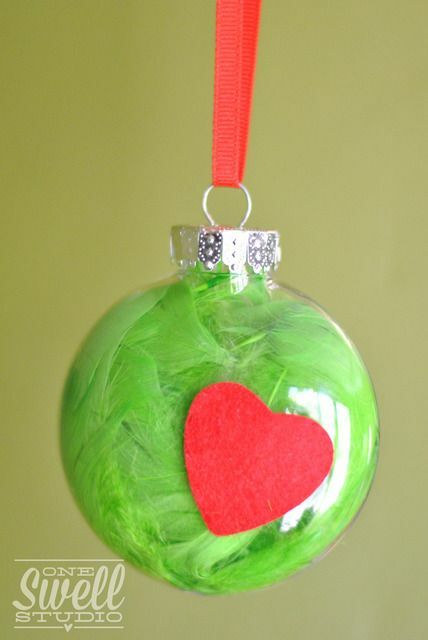 thebooklishlife on Etsy creates these original glass ornaments filled with text from favorite books. If Harry Potter isn't your taste, they've got Jane Austen, The Hobbit, and The Lion, the Witch, and the Wardrobe, too. How undeniably cute is that? From tifanilyn.com, with detailed instructions (yeah!). From catchmyparty.com, DolledUpDishes via Etsy, MuralsYourWay via Etsy, and StyleBlueprint. From Canadian Log Homes, ToeFishArt on Etsy, CambriRae on Etsy, and Finding Home. 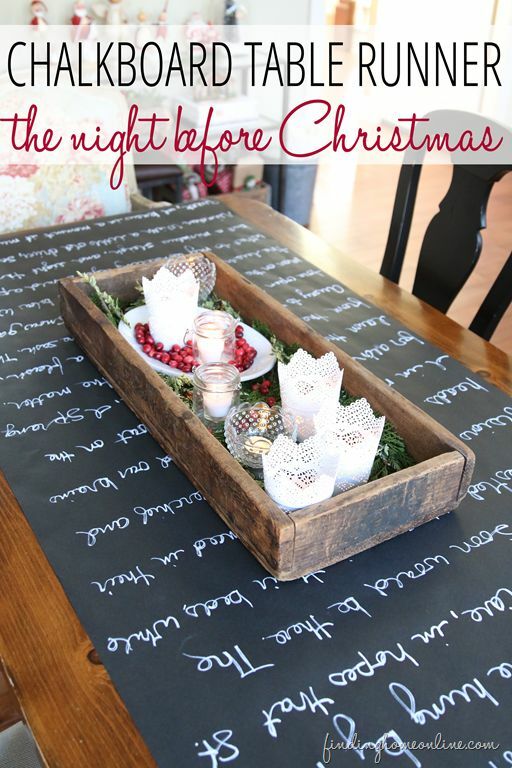 Follow A Book Long Enough's board Christmas Book Decor and Crafts on Pinterest.